"Whether you're counting calories or not, using turkey-style bacon and less blue cheese is a simple way to reduce the calories and fat in this classic main course salad. Topped off with a refreshing avocado dressing, this salad is sure to please!" Avocado Dressing: In a blender or mini-chopper, blend avocado, oil, lemon juice, garlic, cumin, salt, cayenne pepper and water, until smooth. Thin dressing with additional water if desired. Salad: Divide salad greens among individual plates. Place a mound of chicken in center of each. Arrange turkey-style bacon, tomatoes, egg wedges and red onion around chicken. Sprinkle with blue cheese. Drizzle with dressing just before serving. Use diced ham in place of chicken and regular bacon in place of turkey-style bacon. Use shredded Cheddar, Swiss, Gouda or your favourite cheese instead of blue cheese. I made it as directed. I added extra avocado cubes on top and it was most delicious. A new favorite. Loved the salad dressing! Also added avocado slices to the salad...can't get too much of a good thing! Good little cobber. Add a little more water to the dressing and, double up bam bam delicious! 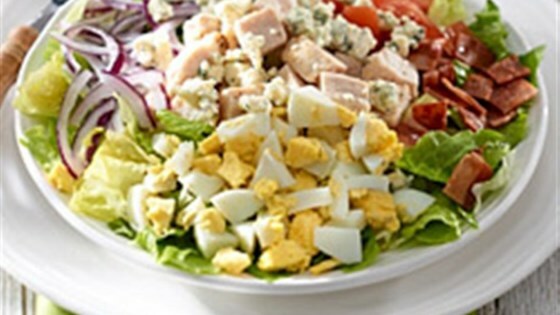 What's not to love about a cobb salad? Hearty & filling! I'm not a salad person but I gave this a try. This is the best dressing I've ever had! Never ate this much salad in one sitting before. We ate every last bit. I thought the avocado dressing might be too much, but I was wrong.